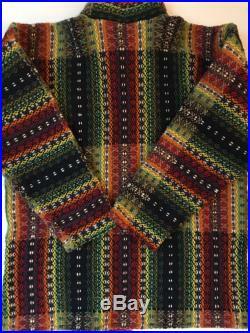 Hand woven tribal jacket -coat - sweater. 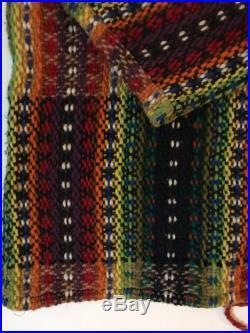 So, so very coolbeautiful rich colors of rustic tangerine orange, lemon, red, teal, white on navy bluewonderful and complex native woven pattern in a loose knit. 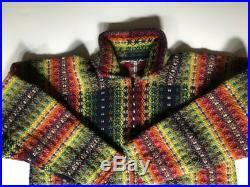 Quite full and toasty with generous collar to be worn up or down. Pull string on bottom as extra closure. 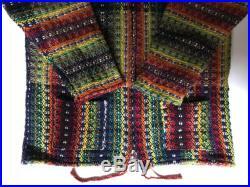 This is a handwoven textile. There may be pulls and distress to the weave, adding to the vintage charm. Although no tags on this piece. 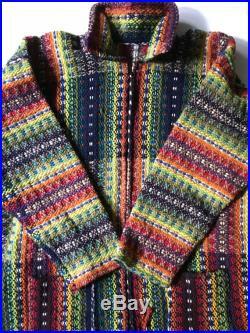 That coat had the label reflecting all wool, hand woven, bolivia. No size - closest to a l xl xxl - although can be worn by a smaller size due to style and cut. Approximate measurements lying flat--underarm to underarm - app. 24" (double this)-length - 31"- measured from back of neck w collar down to low hem. 28 as measured from bottom edge of collar to edge of wrist hem. Please keep in mind all vintage items are atleast 20 years old, many are much, much older. Minor imperfections should be expected in an item of this age. In most cases, the item of this age will not be perfect.